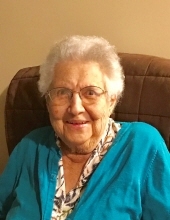 (nee Fleissner) of Grafton, Found Peace on Saturday, March 23, 2019, at the age of 89 years. Beloved wife of the late William “Bill” Griesbach. Loving mother of Susan (Robert) Katrosits, Daniel (Margot) Griesbach, and Judith (Charles) Koenings. Dear grandmother of Therese (Ricardo Bourbonais) and Matthew Katrosits, Brian (Carla) and David (Leigh) Griesbach, Adam (Melissa) and Jenna Koenings. Great-grandmother of Adrian, Oliver, Liam and Max. Dear sister of Ronald and Franklin Fleissner. Further survived by nieces, nephews, brother-in-law, sisters-in-law, other relatives and friends. Preceded in death by her two brothers, John and Robert Fleissner. The family would like to thank the caregivers and staff at Compassus Hospice Care and McKinley Place Assisted Living Community. Visitation will be at the Grafton Mueller Funeral Home, Thursday, March 28, 2019, from 4:00 PM until the time of Prayer Service at 7:00 PM. Additional visitation will be held from 9:30 AM until Mass of Christian Burial at 11:00 AM on Friday, March 29, 2019, at Good Shepherd Catholic Church (N88 W17658 Christman Rd. ), Menomonee Falls. Interment Resurrection Cemetery. In lieu of flowers, memorials to the Compassus Living Foundation or the charity of your choice would be appreciated. To send flowers or a remembrance gift to the family of Joan B. Griesbach, please visit our Tribute Store. 9401 W. Donges Bay Rd. "Email Address" would like to share the life celebration of Joan B. Griesbach. Click on the "link" to go to share a favorite memory or leave a condolence message for the family.